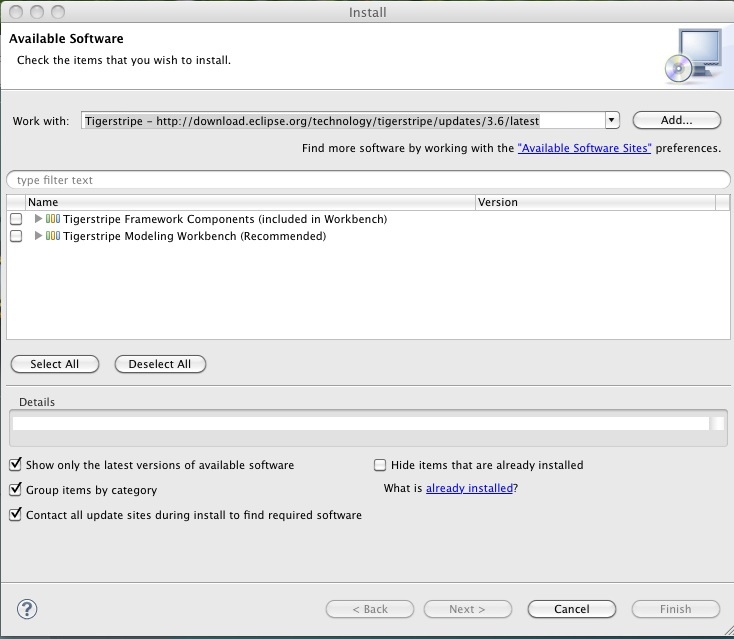 To install Tigerstripe, you must download the Eclipse Modeling Tools package and install it in your Eclipse IDE. Scroll down to the Eclipse Modeling Tools package. To download the package, select the platform you are working on. In your Eclipse IDE, select Help > Install New Software. The Available Software dialog is displayed. Enter a name for the repository (for example, "Tigerstripe"). Copy the Update Site URL from the Tigerstripe Downloads page (http://www.eclipse.org/tigerstripe/downloads.php), paste it into the Location text area, and click OK.
Click Select All, then click Next. The Install Details dialog appears. Click Next. Accept the terms of the license agreement and click Finish. After the software is installed, click Restart Now. This page was last modified 05:43, 15 May 2013 by dkeysell. Based on work by Sue Jarocki.